The tools you use to work with these windows are often in tool bars on any of the screen edges. See sample below from Adobe Premiere CC. The assets window has all the different files and folders in it you are working with, as well as tabs or links to effects, transitions, and other apps. A Bin is a software folder into which video clips and other editing assets get organized in. You’ll have many bins per project and we’ll talk about workflow and naming these bins next week. The term bin is a leftover from the manual editing days (not too long ago), where in the editing process the physical filmstrips would be hanging from a frame built on top of a bin. The top bar of the frame had small nails every half-inch or so from which the filmstrips would hang from their sprocket holes. The bin itself would catch any filmstrips that fell off the frame. Layers are the different tracks in a sequence that are stacked on top of each other. A good editing software has allowance for many (unlimited) video and audio tracks. Graphics and effects live on the video tracks. Normally the most outer track (video tracks mostly get added on top of each other) is the one being seen in the preview window. Audio tracks are ALL heard, unless they are muted. 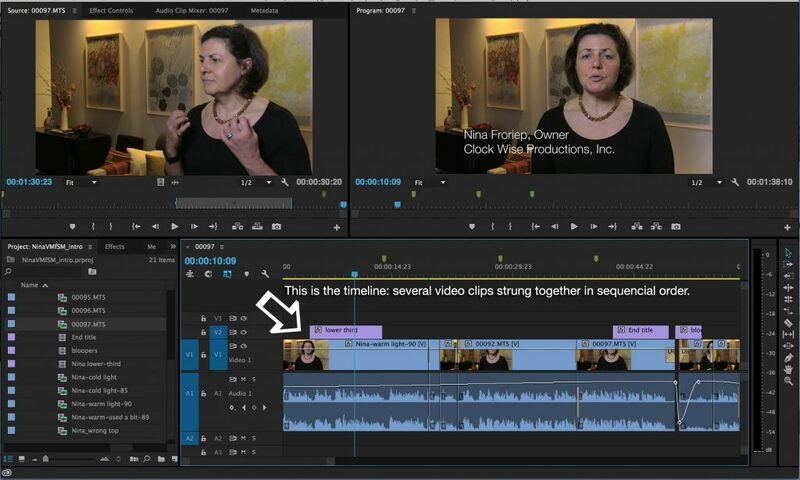 Trim, Cut, Split, and Splice are all done by cutting your video clips. When you trim your video, you remove the head and/or the tail of the clip (much like giving your hair a trim: you’re sprucing it up, but not touching the ‘meat’). A cut is mostly referred to when you remove a section of your video clip, so you cut in two places and lift out the middle section and join the leftover video back together. If you have a very long video, you might just cut it into sections to work with separately, then you’re splitting your video. When you join two video clips together, you splice them. In all cases make sure you SAVE AS your entire video clip before you edit away. Depending on your software, you might lose your cut or trimmed part of the clip (this goes especially for in-phone apps!). 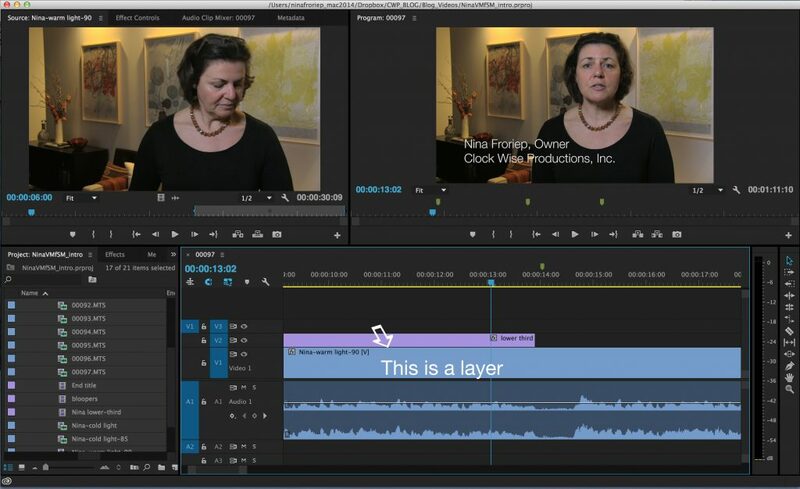 The sample below shows a timeline in the right lower quadrant of the edit software (Adobe Premiere CC). The vertical lines delineate one clip from another. Video is on the top layers and audio on the bottom. Ok, think TT (Throwback Thursday). In the not so distant, old days, editing was linear. You added one video clip to another in sequential order and going back and changing something, meant the entire sequence after your edit, meaning going forward, needed to be moved up as well. Think even further back to editing filmstrips: You took out a section of film you moved up the entire subsequent section to close the gap. Today, all editing software is non-linear. Which mostly means that you can go into an edit totally unprepared and keep editing until you ‘strike gold’. 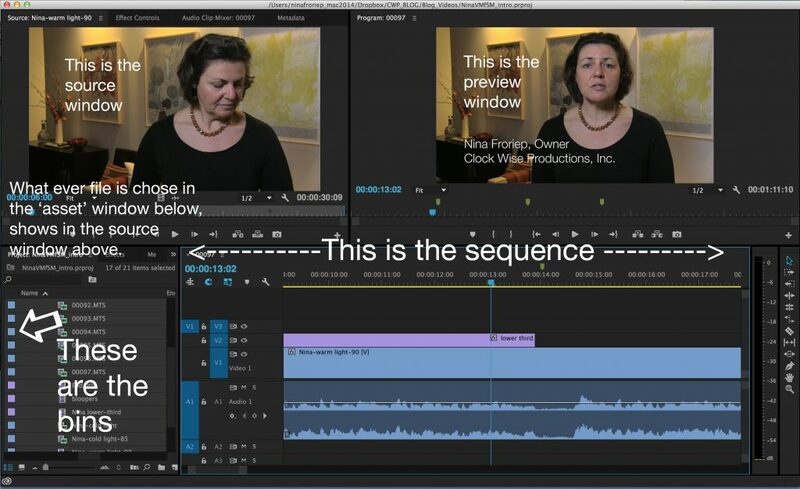 A Jump Cut is a cut in film editing in which two sequential shots of the same subject are taken from camera positions that vary only slightly. This type of edit gives the effect of jumping forwards in time. When I started – decades ago – jump cuts were frowned upon. Today we have ‘learned’ to look at them and understand that an edit was made at the place where the jump cut is. A good editor will make such a cut so seamless that it flows with the narrative, or content and won’t be perceived as disruptive. Understanding Jump Cuts from Riley Hooper on Vimeo. B-roll (also B roll) is supplemental footage inserted into the main footage as a cutaway to help the story along. It’s particularly helpful during interviews to illustrate what’s being said and to break up the often visually boring talking-head footage. The explanation to where the term B-roll comes from is a bit more involved. It stems from the use of 16 mm film editing where so-called A- and B-rolls alternated shots to allow for fades and dissolves between shoots. Somehow the term B-roll was later ‘abused’ for the conceivably less important support footage.